We are a leading Wholesale Trader of autofy car interior fans, autofy bike filters and autofy car air purifier from New Delhi, India. 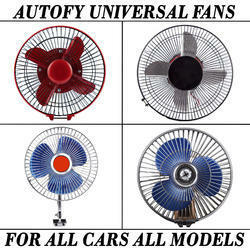 Autofy fan has been created to be a person’s best friend during Indian Summers. Commuting in a hot weather is something everyone tries to avoid owing to the difficulties caused by high temperatures. Even air conditioned vehicles fail to counter the heat in peak hours. This problem of proper air circulation is solved by Autofy 6 Inch 12V DC fan. This fan has been designed by keeping in mind the minutest details of needs of air circulation in a vehicle. The most important feature of this fan is its super silent motor that holds the capability to acquire speeds up to 1800 rpm while consuming only 12V of electrical energy. Another feature that makes this fan unique is that even the fan blades have been dedicated to power saving. Made of ultralight and super flexible plastic, the fan blades are not only durable as they are anticorrosive but also require least push by the motor to begin rotating. The flexible blades also serve safety features as they tend to bend in case of any obstruction in rotation. So, you no longer have to worry about your child hurting themselves by inserting finger into running fan. The grill too is made of high quality steel that is sturdy and prepared to protect the fan against large amount of pressures. Utility features include an additional motor in the bottom of the fan unit that facilitates oscillation to provide air circulation to and from all directions. The stem of the fan makes it highly customizable as it can be titled from two points to ensure no area in the vehicle is left out. It is due to these factors Autofy 6 Inch 12V DC fan is all you need to install in your vehicle and never fear travelling in hot weather. 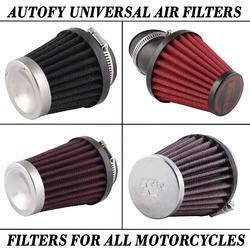 Autofy High Power are the best Air Filter made available to you at a very low and reasonable price. This Stainless Steel Conical air filters are widely used because of the find cotton used which is meshed with wire on both sides. It is a universal product compatible with all bikes and scooters (geared / non – geared) of any model. It is designed to improve Acceleration, Torque and Horsepower. This filter has a lifetime investment because it can be reused after proper cleaning. The double mesh makes it strong and long lasting. The premium quality cotton filters dust and other fine particles. This is the best product for bikes like Harley Davidson, Bullet, Royal Enfield, Thunderbird, Avenger, Pulsar, Duke KTM, Harley Davidson, Yamaha FZ, R15, CBR, Ninja, Apache, Hayabusa and others. Autofy brings yet another quality product this time too at a reasonable price. Understanding the importance of well and healthy being, one must realize that the quality of air he breathes makes an astounding impact on his health. Mostly air happens to be polluted and full of germs in the places with poor ventilation, for example, a car. 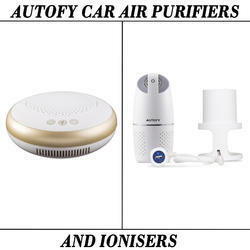 Autofy Air Cleaner is an attempt to maintain your car’s hygiene by cleaning the air inside your car. For this purpose, Autofy Air Cleaner , thanks to the premium quality filters that make sure no unwanted suspended particle is left in your car. This incredibly efficient yet portable air cleaner is capable of filtering out not only dust and scurf particles but also harmful PM 2.5 air pollutants. Apart from cleaning the air, this equipment also serves the utility of freshening up the ambience within the car by removing unpleasant odors like that of a, sweat or stale food. Being super compact in size and eye catching in appearance, this air cleaner does not disappoint at any attribute as it fairly blends in with your car interior as if it is a part of it. Its usage is not limited to cars as being portable in size and weight, it can be carried into the house or office to have a breath of fresh air whenever you want it be it in city traffic or the muddy outskirts. All you have to do is turn on this small appliance, sit back and relax.